INDIANAPOLIS – Sleep, pain, anxiety, depression, and low energy/fatigue (known collectively as SPADE for short) symptoms are extremely common, but often unrecognized and undertreated by primary care physicians. 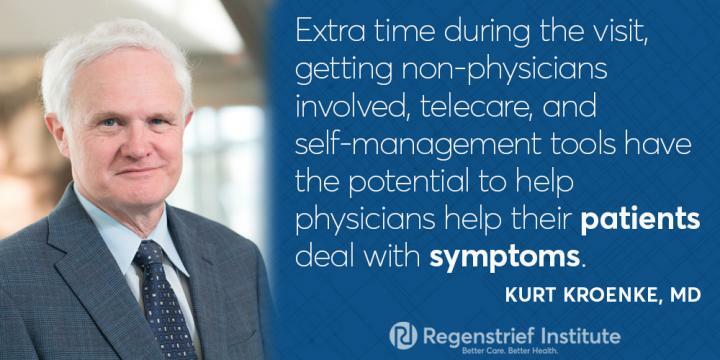 A new Regenstrief Institute study has found that patients want to tell their doctors about their symptoms and would be willing to do so via a formal reporting system, but patients are reluctant to report symptoms if they perceive busy clinicians will not use that information to improve care. “We — health care systems and the doctors who work in these systems — haven’t figured out how to deal efficiently with symptoms. Some doctors want to know about symptoms but others don’t see how they can work discussion and follow-up on symptoms into an already busy primary care visit,” he said. Authors of the study, in addition to Tasneem Talib, Ph.D. of the Regenstrief Instituete and Kurt Kroenke, M.D. of the Regenstrief Institute and Chancellor’s Professor and Professor of Medicine at Indiana University School of Medicine are Regenstrief Institute Research Coordinator Paige DeChant, B.A; Jacob Kean, Ph.D.; Patrick O. Monahan, Ph.D.; Regenstrief Institute investigator David A. Haggstrom, M.D. and Madison E. Stout, B.S. The work was funded by the Patient-Centered Outcomes Research Institute.